Self-reliance is the name of the game. Berklee College of Music graduated musician Jake Glasgow has a great creative scale as MIDI expert at Coda Music Technology, as teacher of inTune, a school of contemporary music offering private music lessons in Brass, Woodwind, Drums/Percussion, Bass, Guitar, and Piano, as a studio musician with groups all over the United States, as a producer, writer, arranger, and sound designer on countless projects for Television, Radio, and indie film, as a clinician for schools and as initiator of his own solo career. Jake started with the 2007 release, Hangin’ With Mister G. As you can see on the cover, the "G" is also center of his sophomore album Keepin' On (2010). Most of the instruments on this album are performed by Jake with assistance of special guests Matt Ramerman (drums), Brad Johnson (bass guitar), Peter Bagale (vocals), Nick Rosenthal, Matt Merritt, and Jeff Reichman (guitars). When you are on the search after a new sound, give A Tip Of My Hat a listen. After starting as a dynamic smooth jazz tune, the track soon develops a high-handed existence of a special kind. Jake's treat of the sound is really innovative and unique. Short guitar riffs followed and expanded by Jake's sax build the main theme on Delray. Romantic mood is shining through Good Journey. Jake is creating a relaxed atmosphere with his sultry sax ambiance. With Keepin' On Jake develops an appealing melody to a hypnotic fanal. Bump is short and raises the attention. Bump is Funk. Ooh Child is featuring singer Peter Bagale, who is usually to find in fields beyond your imagination with his project 10x10 Music. The catchy Corduroy Jacket pleases with a vivid horn arrangement. Have a Sweet Tea after a long-distance walk. This is fine artwork. More Funk on The Taker. Wah guitar and steaming sax right in the pack. Perhaps it were the Mayers Lake Ontario Winery & Vineyards, which inspired Jake to write the final At The Lake. 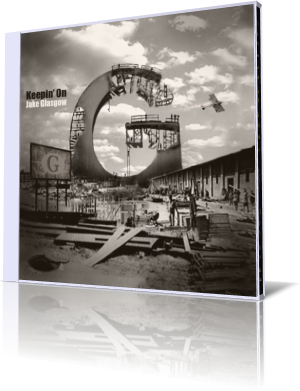 Jake Glasgow's sophomore album Keepin' On is full of new ideas perfectly set in scene. The ultimate jazz brew.